Chadwick Boseman took a moment to recognize a real-life superhero. On Monday night Howard graduate Chadwick Boseman won the “Best Performance in a Movie” award at the MTV Movie Awards for his performance in Black Panther. Hardly a surprise but what he did while on stage did catch some off guard. During his acceptance speech, Boseman brought a real-life Superhero onto the stage. James Shaw Jr., a Tennessee State alum, surprisingly accepted the invitation onto the stage. Boseman gave his “golden popcorn statue” to Shaw to keep while heaping praise on him. Back in April, the 29-year-old wrestled an AR-15 assault rifle from a gunman who burst into an Antioch, Tenn. Waffle House and opened fire. 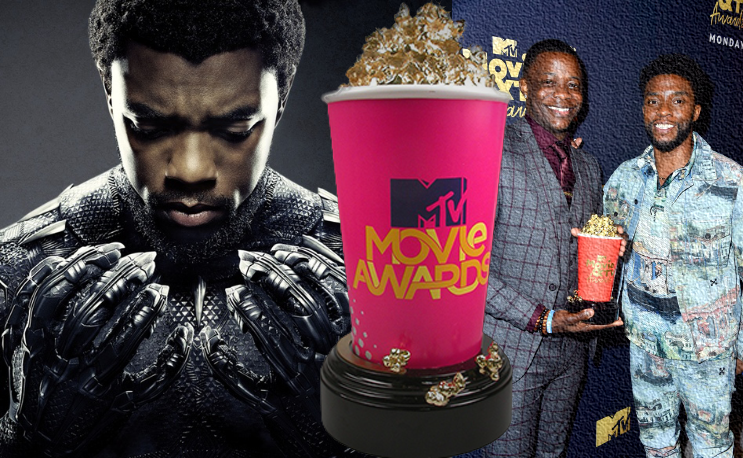 Chadwick Boseman won the Best Hero award at the MTV Movie & TV Awards for "Black Panther". “You didn’t even know we were about to do this,” Chadwick laughed as the crowd erupted in applause. “If you don’t know James – he fought off a gunman in Antioch, Tennessee … a Waffle House. He saved lives. Shaw set up a GoFundMe page in the aftermath of the shooting for the victims and their families. In May, he presented a check of more than $241,000 to the families, and injured victims, at a private ceremony at Tennessee State University.